The average weekend non-holiday adult ticket price is now $81. 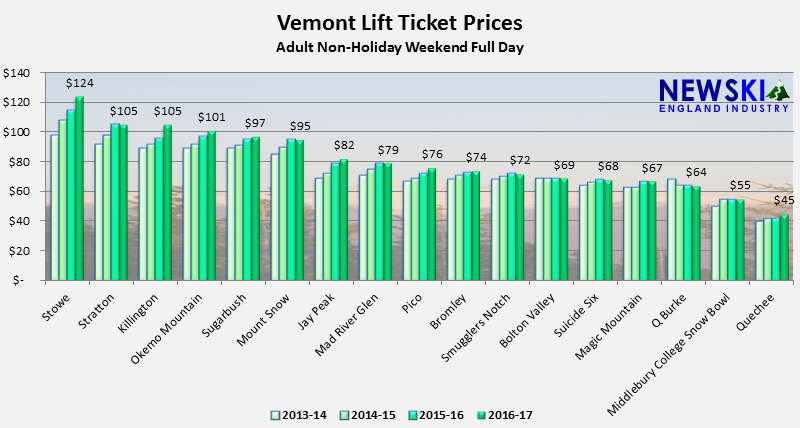 Keeping in line with recent winters, Vermont lift ticket prices have increased by an average of 3% for winter 2016-17. Stowe is once again the most expensive lift ticket in New England, coming in at $124 for a full day adult weekend non-holiday lift ticket, a $9 increase over 2015-16. Stowe was the first to cross the $100 line in 2014-15. Since then, Killington, Okemo, and Stratton have all eclipsed the $100 threshold. 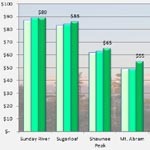 Despite a $3 increase, Quechee remains the cheapest chairlift served ski area in the state at $45 per day. The 2016-17 statewide mean is $81.06 per adult non-holiday weekend full day lift ticket, a 3% increase over 2015-16. The median price is $76.00, also a 4% increase. The 2015-16 mean was $79.00 (4% increase over 2014-15) and median $73.00 (3% increase over 2014-15).